My day wasn’t going well and it was still early. Heading outside to hang around a butterfly, I guess, is one way I’m coping with confusing times. I’ve probably written before that I love the smaller, perhaps less noticed butterflies, as much as I do the fantastically big and colorful ones. They might be small, but up close, they have amazing patterns and intricate details. 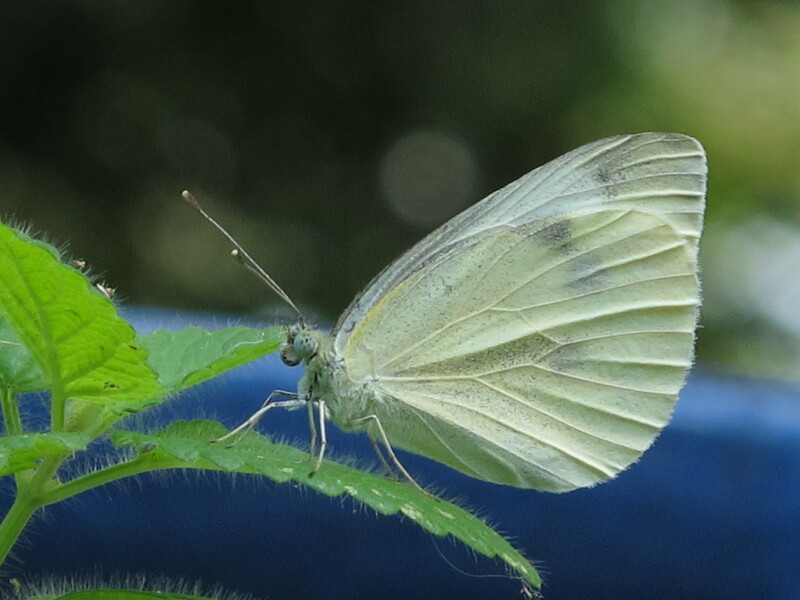 While sitting with my morning coffee, feeling altogether displaced, which is an experience that hit me hard after a recent move, I was drawn to the white butterfly dancing around my container plants. I had moved the plants to the corner of the lawn, hoping they might catch some rain. I put the bird bath in the middle of the containers, which to my surprise, created a space I especially liked. I’m pretty sure my winged visitor was the Cabbage White Butterfly. A pair showed up about ten days ago and have since been fluttering around my sparse container garden. Mostly, the butterfly was getting some needed morning sunshine, favoring the Lemon Balm for this purpose, and the yellow Lantana for sipping nectar. I sat down in the grass. A few times, I thought the pretty white butterfly was going to land on my arm or shoulder, but instead, it playfully swooped and danced around me and my camera. A silent call to play took hold and for a little while, I was free to play, just like the pretty white butterfly! Robins are a fun bird to watch! I mentioned in an earlier post that a neighbor and I were birdwatching together one day, when he told me the American Robin hops, and then stops, so that it may hear a worm. So, you can imagine my delight when I captured a few images of this Robin listening for what I feel safe in assuming, worms! 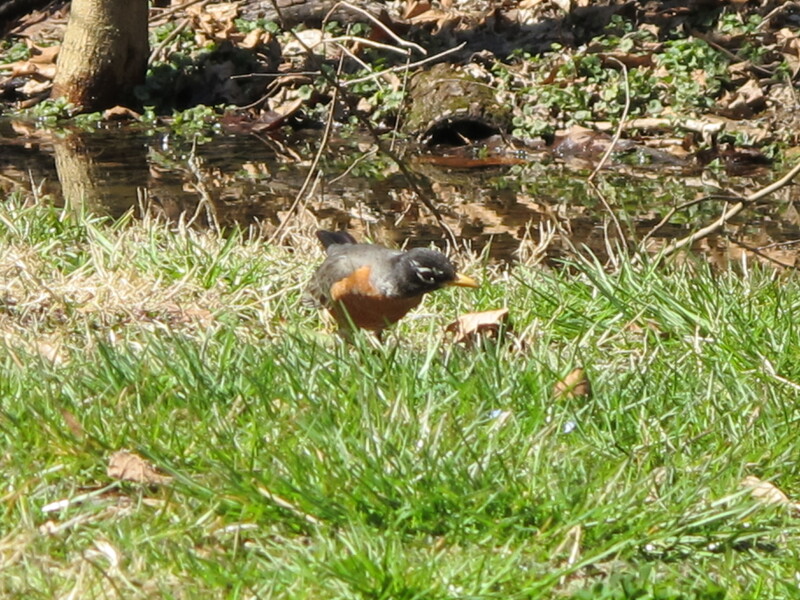 I can’t think of a better springtime song for a Robin, as the sound of a worm in the cool dirt. The Red-Breasted, Winter Flock, a photo by Rosa Blue on Flickr. 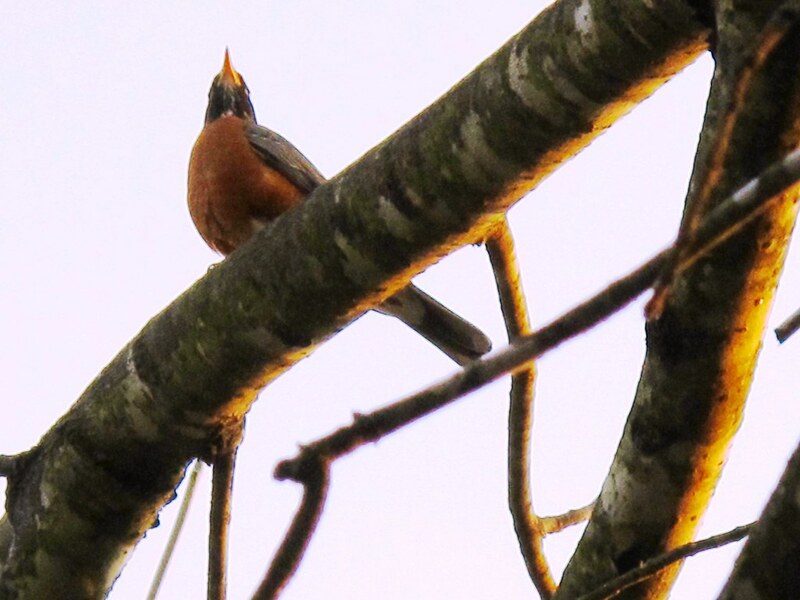 My son was first to see the flock of Robins, alerting me with an excitement I hadn’t heard in a great long time. That was a blessing in itself. “Mom! You gotta come see!” he exclaimed. “Just for a minute,” he added. I knew I had to go see what he saw. 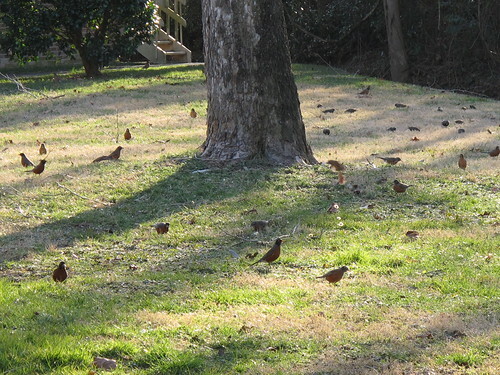 I made it to the door in time to see the flock of American Robins gracefully landing on the moist and cold grassy lawn. The slight sound of their wings in flight, I can still recall. I like that. I am grateful to be alive in these moments. Life is not easy, at least not for me, so when nature shows her awe, I do take notice. I catch a trillionth second wind moving me to carry on. The red-breasted beauties hopped, stopped, and hopped again. My neighbor said they they hear worms, so they stop briefly to listen for them. I don’t doubt this, because bird brains are pretty darn smart! I do however wonder if wintertime lawns have worms to offer. A fully grown man, my son, stood with me watching the birds, both of us glad to be there, together, without words and absolutely taken by the moment. (Originally posted on Flickr. Edited on January 28th, 2014). Thanks for visiting Green Healing Notes. Please feel free to leave your thoughts in a comment. The cool air drew me outside today. I’ve been under the weather lately, but this mid-November morning brought me healing energy, for which I am most grateful. I’m also grateful for my friend, Ruthie Mae. She’s my pretty dog who recently turned eight years old. She’s one of a kind and I sure do love her. She helps me in lots of ways. Ruthie helps to get me outside and whether we sit on the deck for a view and breath of fresh air or take a walk, being outdoors is healing. Since the arrival of fall, my backyard birds have changed. The Cardinals stayed until a couple of weeks ago, so I’m not sure where they are now, but many of the birds that spent the summer here went on to warmer places. 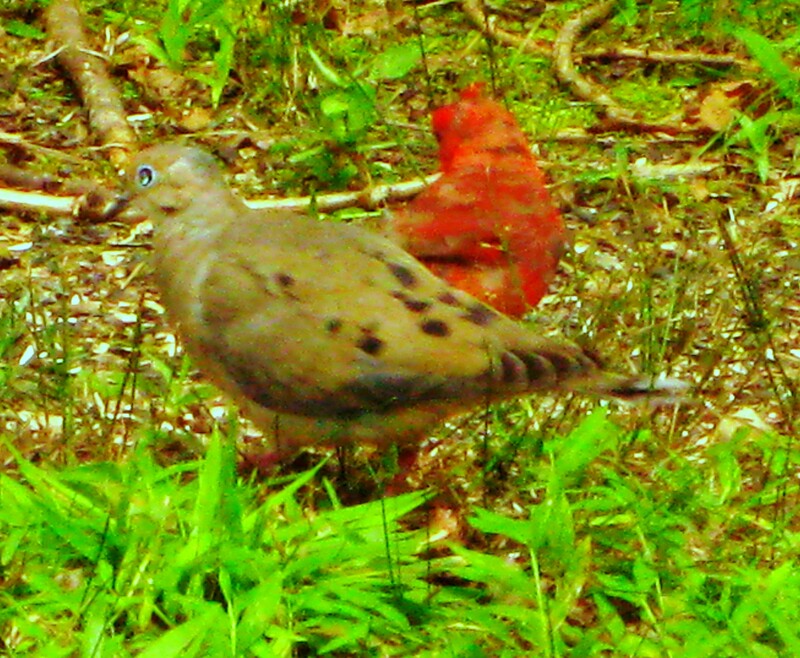 The Mourning Doves stuck around and lately, they come in large flocks to forage amongst leaves, grass and fallen seeds. The temperatures have dropped. I decided to add sunflower seeds to the bird station after having changed over to a simple offering of smaller seeds, along with fresh water in the bird baths. Within ten minutes, my yard once again became a little haven, very much like I would imagine Heaven. Sometimes, I’ll be standing at the door looking out from my window, and just like in a fairytale movie, all sorts of pretty birds fly into the yard at once. Often times, a larger bird will slowly glide over us too. I usually see a shadow first and then a wonderful view as it circles above. I am always captured by a magical sense of awe when my yard comes alive with color and sounds and movement. Thank you for visiting Green Healing Notes. I hope you enjoy a view of these beautiful moments I’ve tried to capture. 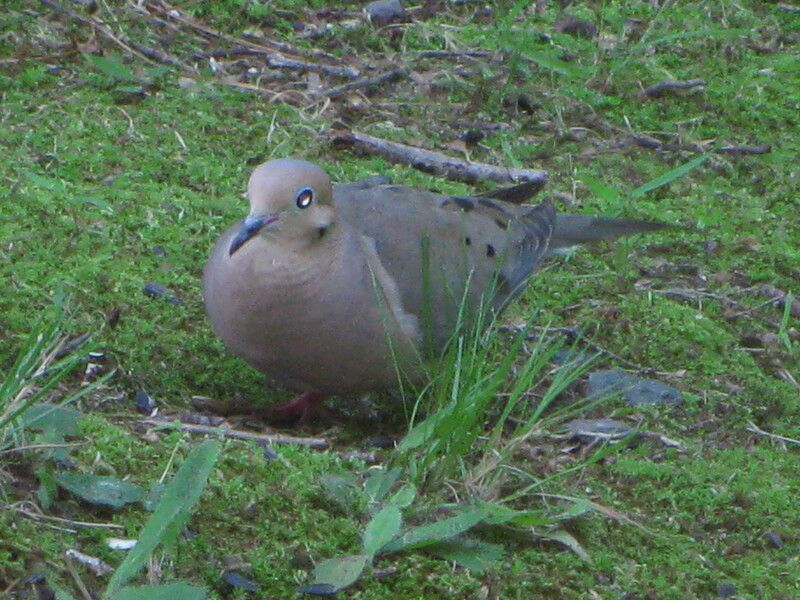 “By virtue of their melancholy call, Mourning Doves have been fittingly named as such. Their distinctive “wooo-oo-oo-oo” sounds may evoke a feeling of grief over the loss of a dearly beloved. 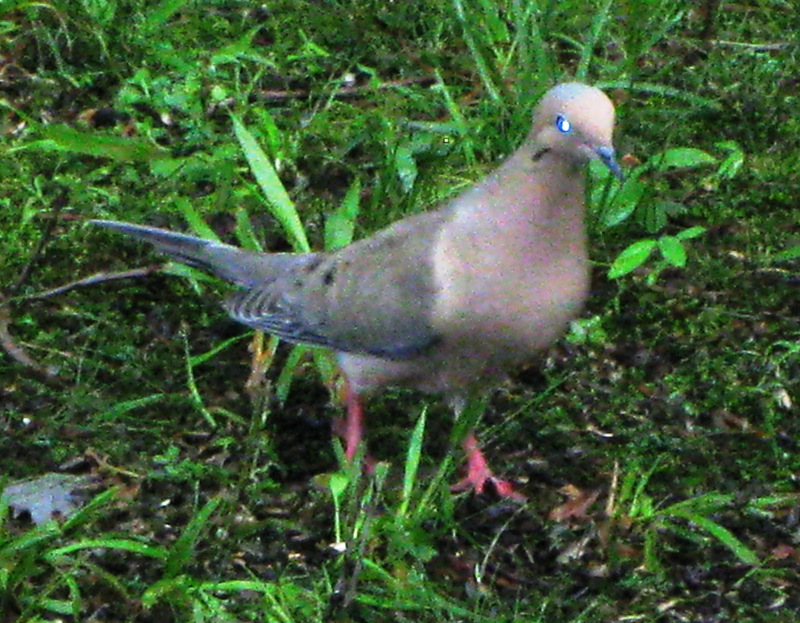 The pair of Mourning Doves were, in the beginning of our meeting, weary of me and my little Canon. 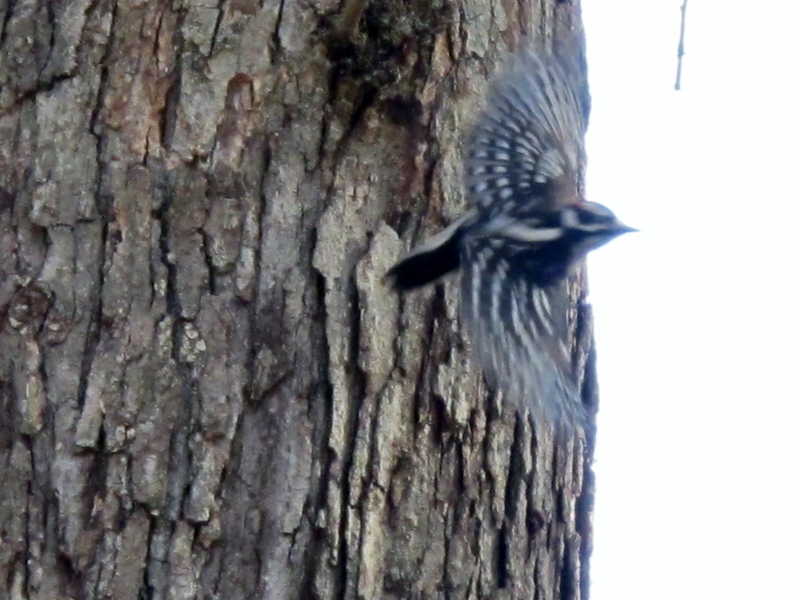 The slightest movement or noise always prompted their swift flight into the woods. Through the passing seasons, I’ve become familiar to the doves and they’ve grown comfortable with me. I like watching them walk the way they do, with obvious intention, bobbing their soft pretty heads in the grass. The birds first appeared in my backyard during Winter. Our dog had very recently passed and my heart was full of grief. 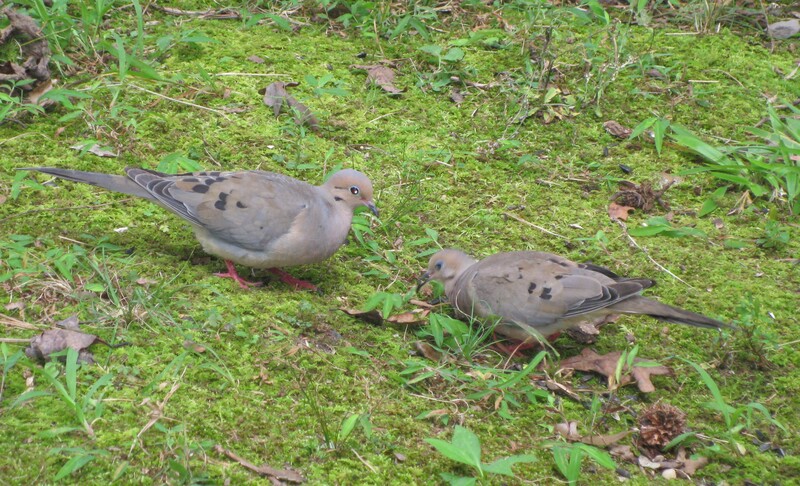 I heard the ‘cooing’ sound one day and to my surprise, when I opened the door, two Mourning Doves (Zenaida macroura), were perched about ten feet away on a line that had once been a dog-run. Our new bird-feeder was hanging from it, which I guess attracted the birds. The birds presence struck my heart-strings. Sadness had the biggest part of my heart when my new backyard flyers arrived. I missed our dog in a terrible way. I felt flooded with loss and pain. 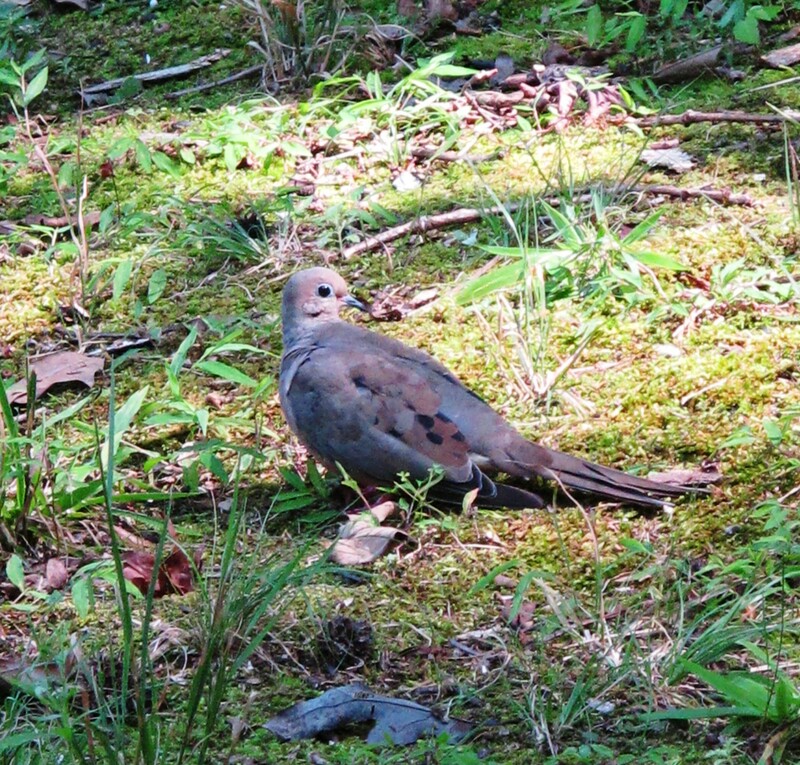 SOURCE: www.native-languages.org, Native American Indian Dove and Pigeon Mythology. I did wonder if the birds appearance was an omen. I wondered about my death. I was not well, and hadn’t been in some time. In fact, my health was at an all time low. The thought that my life might soon end had passed through my mind more than once during Winter and when the Mourning Doves appeared, I was acutely aware of the doom I felt. I decided to allow my intuition to guide me in my understanding of the birds timely arrival to our little home. 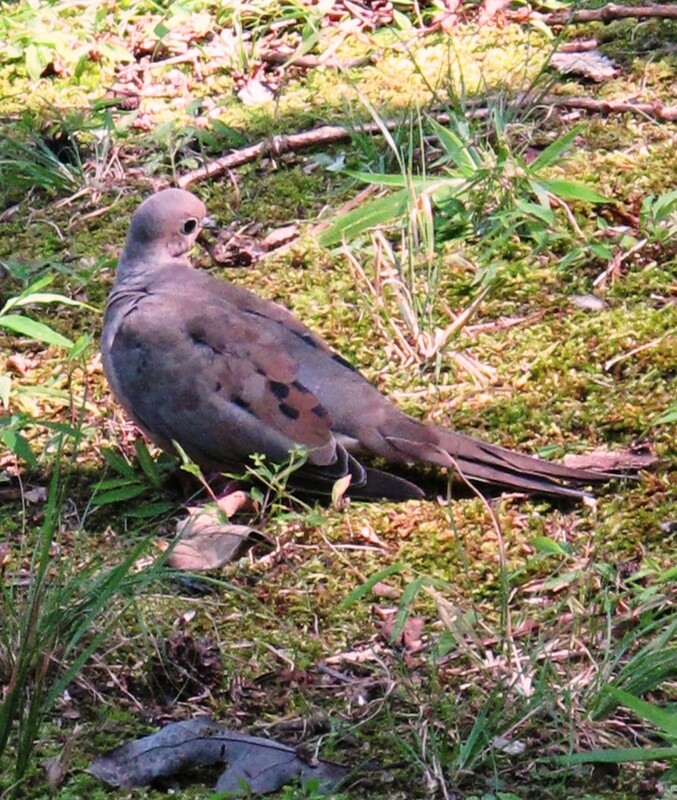 Doves (Columbidae) have strong maternal instincts and both parents go to great lengths to protect their nests and hatchlings. Perhaps this is the meaning of their visit, I thought to myself. Part of the sadness I often feel, apart from being physically ill, which is depressing, is that I just can’t seem to get things right in my life, particularly regarding family and home. I have devoted most of my time to being available in this arena, but sometimes it seems like I haven’t made much progress. Surviving our most recent winter was especially difficult. I was truly worn out! I spent a lot of time in my bedroom watching movies, crying over the loss of our dog, and trying to be more available to my sweet Ruthie. She had been the greatest nurse in the world to her pack mate. She never left his side and did amazing things to help him feel better before his time was up on this earth. Now, she needed me. A Robin had come to stay for the season, living off the Holly berries on the little tree near my bedroom window. Every day I watched the bird fly from his high resting place in the Sweet Gum tree, down to my porch railing, where he feasted and occasionally, warded off other interested birds. Watching the Robin made my days of hibernation more interesting and gave me a direct connection with nature. 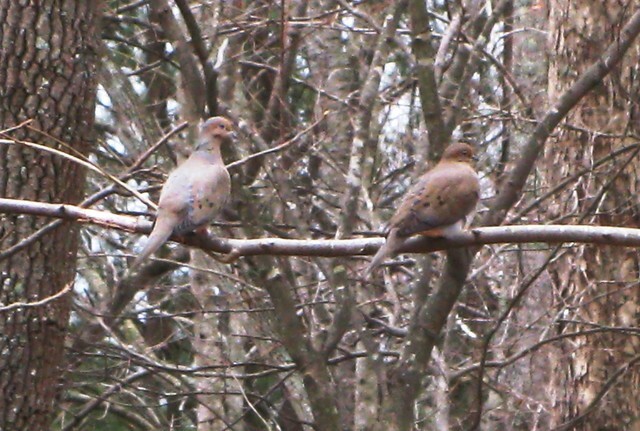 The doves spent the rest of the cold weather perched on high branches, just past my backyard tree line. Spring started what has been an incredible bountiful time in my yard for the many birds that decided to call this place home. Carolina Wrens nested by my window. I listened and watched them from the first days the mother started gathering materials (some of which came from my LL Bean sleeping bag), until the last little hatchling literally fell from the nest. The Cardinals like my yard too! I’ve been especially humbled watching both the female and male feed their young. 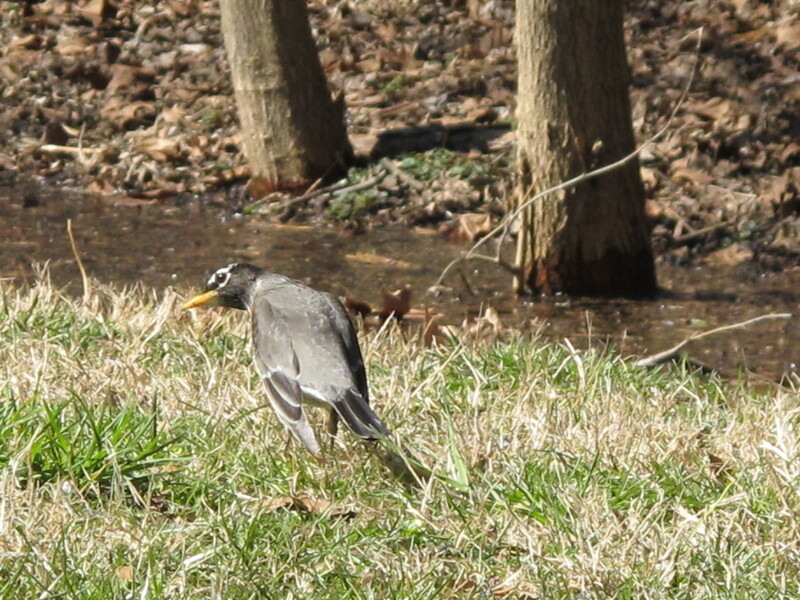 All the birds I’ve seen in my yard are incredibly attentive and committed parents. My backyard birdwatching has touched me in a primal way. Strangely, I have wanted to be more like the birds. Watching them care for their families was humbling. I wished for whatever it is they have that makes them so incredibly focused on their task at hand. I told a friend my thoughts on the matter. I understood what my friend was saying, but the longing in me remained. Spring has passed and Summer is whispering an inevitable departure. My backyard has been more quiet during these last days of August. 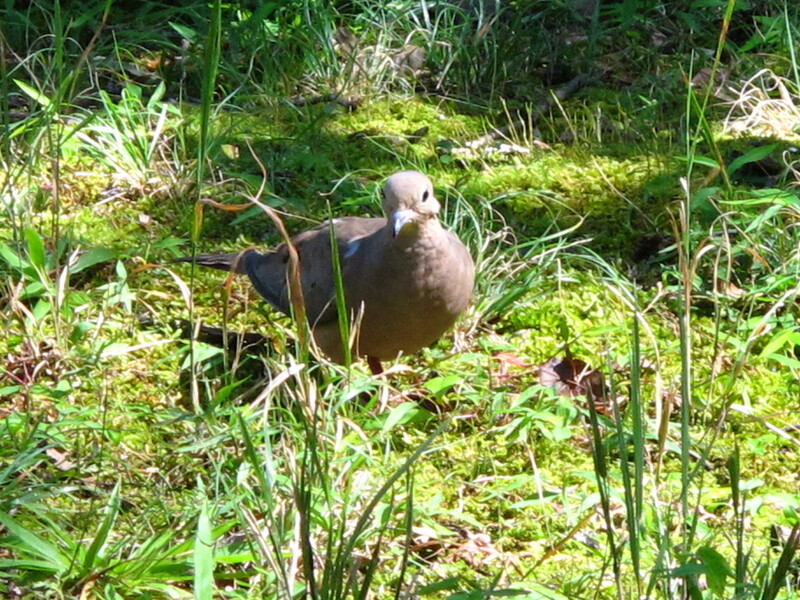 I’m happy to report that the beautiful winged doves are still around. They’re foraging in the grass as I write, along with a couple of Cardinals and a Rufus-sided Towhee. I think I’ll take a walk outside, quietly, so that I can get a more intimate view. 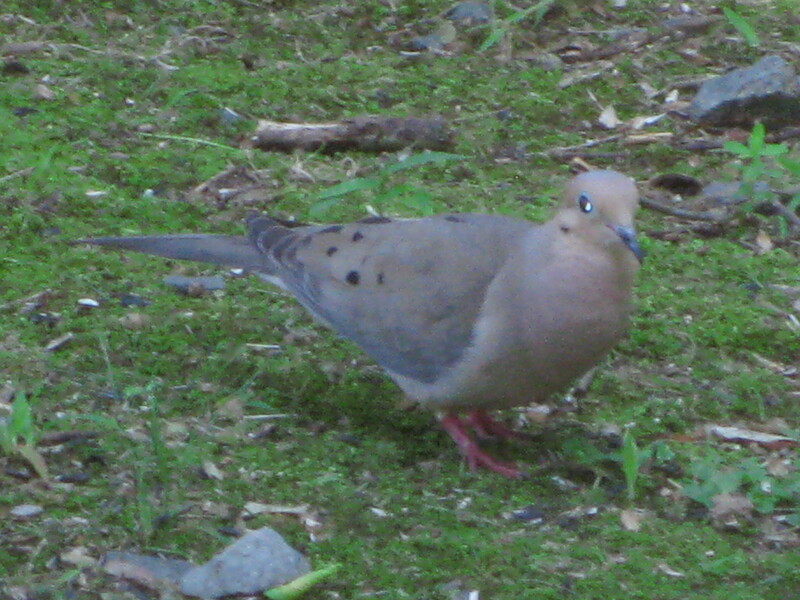 Below is a gallery of Mourning Doves in my yard. You may click on each photo for a larger view. I hope you enjoy! Miss dogkisses, You are too close to show off my long feathered tail! Thanks for your visit to Green Healing Notes!